“Waiting on Wednesday” is a weekly meme where I post about an upcoming book that excites me. It’s currently hosted by the blog Wishful Endings. 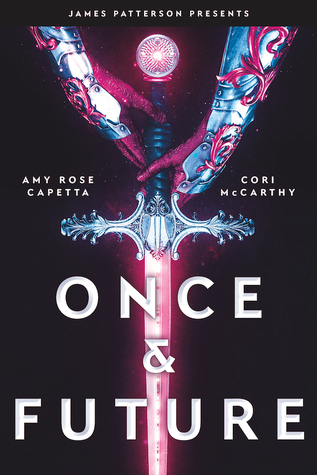 I’ve been unbelievably excited about Once & Future by Amy Rose Capetta and Cori McCarthy ever since I heard that it was a queer, YA, gender-bent, sci-fi retelling of Arthurian legend. I’ve been chased my whole life. As an illegal immigrant in the territory controlled by the tyrannical Mercer corporation, I’ve always had to hide who I am. Until I found Excalibur. If you follow this blog, you probably know I’m always interested in queer science fiction and fantasy. You might also know that I took a class on King Arthur last semester. So this book? Something I 100% need to read. Its release date can’t come soon enough. Once & Future is released on March 5th, 2019. It totally seems that way. Have an ARC of this that I’m dying to read!